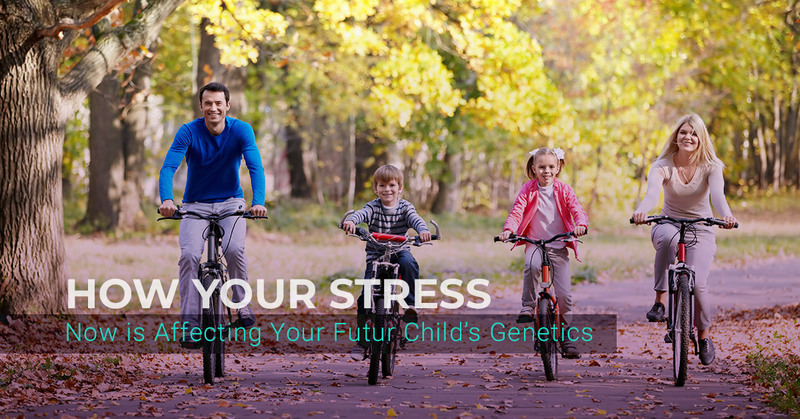 Preventative Health: Is Stress Affecting Your Child's Genetics? Most people know that stress is bad for their health. It can increase your risk of developing certain medical conditions such as heart disease, stroke, and diabetes, all of which could dramatically reduce your quality of life or even shorten your life significantly. But what many people don’t know is that the stress you feel now could actually affect your children’s health in the future. It turns out that the stress levels in both mom and dad are to blame. That’s because there is evidence that stress can change genetics and development in ways that preventative health measures aren’t going to be able to combat entirely. Nutrition. What mom eats is passed onto her developing baby. This is why getting the right nutrition (such as plenty of folic acid and protein) is so important during pregnancy. Your baby’s development depends on getting the right nutritional building blocks. Illnesses. Some illnesses can pass through the barrier from mom to baby. While most illnesses such as cold aren’t going to have a big impact on the development of the baby, some (such as infection) can become life-threatening. Higher levels of stress can also lead to problems with lower birth weights and a higher risk of miscarriage. Mom isn’t alone in passing her stress onto her children. In fact, fathers can have an impact on the health of their children before they have even been created. That’s according to a new study presented at the American Association for Advancement of Science’s annual meeting. The study found that the stress a father experiences can change their sperm, which in turn impacts their future child’s genetics. Children of fathers who experience periods of high stress might have a more severe reaction to their own stress in the future and could be predisposed to stress-related issues such as depression and anxiety. It might not just be periods of high stress that create these changes in the sperm, either. Changes in the sperm’s vesicles, which hold genetic information that’s passed onto the offspring, have been observed when the father experiences even mild stress. Paternal stress before conception can affect your child’s stress response and development later in life. Maternal stress during pregnancy can affect the child’s brain development and impact their later life. It’s good that genetic research is giving us insights such as these. It allows prospective parents to take preventative health measures to protect the development and well-being of their future children. If you are concerned that your current stress levels are going to impact your children, then now is the time to start taking actions to help reduce your stress and combat potential negative effects. If you and your partner plan on having children in the near future, the time to reduce your stress levels is now. This will help you develop healthier sperm that carries positive genetic information for your child’s development. There is evidence that stress can also reduce the motility and number of healthy sperm that you produce, meaning that higher levels of stress could inhibit conception in the first place. Moms will want to focus on stress reduction both when trying to conceive as well as throughout the pregnancy. There is evidence that conception can be inhibited by stress, so reducing it may help you get pregnant sooner. Plus, those early days and weeks of development are crucial to the health of your fetus, so you don’t want to wait until you know that you are pregnant to start taking stress-reducing measures. Meditate together. Meditation and mindfulness can help you focus on the here and now without worrying about what’s happened or what’s yet to come. There are many ways to practice mindfulness, including adult coloring books and guided meditation through an app on your phone. Explore what works for you both. Eat healthily. It’s a lot easier to eat healthy when you are doing it as a couple. Focus on creating meal plans that are full of stress-reducing and fertility-boosting ingredients. Good news: dark chocolate is great for stress reduction! Get more exercise together. Increasing exercise isn’t just good for stress reduction, it’s a good opportunity to spend quality time together. Find something that you both enjoy, whether it’s jogging, playing tennis, or just walking the dog in the evening. Physical exercise helps release stress-reduction chemicals in your brain that can support your mood long after the exercise is done. Your genetics play an important role in how you feel, deal with, and combat stress. Learning more about your genetic makeup now could have a positive impact on your children in the future! We can help. KlothoGenics can help you gain insight into health and help you plan the diet, exercise plan, and supplements that are ideally suited to your genetic makeup. All of this can work together to increase your overall well-being, which is good news for you now and for your children in the future. Make an appointment for our free 15-minute consultation on our services today!